Former Nigeria goalkeepers Joe Erico, Ike Shorunmu and Joseph Dosu have said the return to training of former Super Eagles captain, Vincent Enyeama, is not a threat to the Russia 2018 World Cup chances of Ikechukwu Ezenwa and Daniel Akpeyi, who played in the Eagles’ qualifiers. Nigeria qualified for football’s showpiece event with a match to spare after beating Zambia 1-0 in a World Cup qualifier in Uyo earlier in October. Eagles’ coach Gernot Rohr was faced with goalkeeping problems when Carl Ikeme, who had been the team’s first choice keeper since Enyeama’s retirement in 2015, was diagnosed with acute Leukaemia. Enyeama has been approached by Rohr to return to the Eagles with the calls becoming persistent after Ikeme’s sickness. But in April, the 35-year-old ruptured his knee in Lille’s 2-0 loss to Rennes – and has been replaced in this season’s games by Mike Maignan. Rohr has had to make a choice between South Africa-based Akpeyi and IfeanyiUbah’s Ezenwa, who have given different performances in the team’s recent Africa Cup of Nations and World Cup qualifying matches. However during the week, the former Enyimba goalkeeper announced his return to training with Lille’s first team on social media with videos of himself undergoing drills both with the team and alone as he works towards his return to form. With Rohr saying a return to regular club action for Enyeama will open up a return to the Eagles, it is expected that his return to training would ring warning bells to Akpeyi and Ezenwa, who have alternated the starting role in recent matches. But former Nigeria keepers Erico, Shorunmu and Dosu believe that Enyeama’s return would not hinder the chances of the other keepers in the team. Erico said Enyeama’s return from injury was welcome but advised that the Eagles’ most-capped player should focus on his return to club form rather than having a return to the national team in mind. “It is a good thing to read about Enyeama coming back from that long-term injury. I am happy for him but I would want him to focus on his club form and help his club out of their current situation rather than aiming for a return to the Eagles,” he said. Shorunmu, who Enyeama deputised at the Korea/Japan 2002 World Cup, advised the 2013 AFCON to be cautious of a return to the national team. 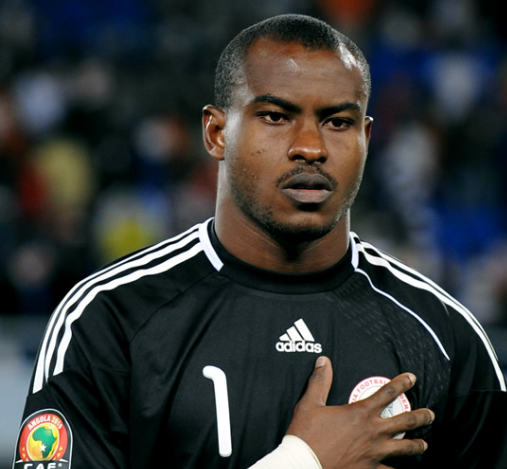 He said, “Enyeama should not rush to return to the Eagles, where he left of his own will. He is not a threat to anybody because when he was not around the team did well with the goalkeepers performing well. He should focus on his return to form and get his good form back. But Dosu believed Enyeama should not be forced out of retirement. The Atlanta 1996 Olympics gold medallist said, “The media has been awash for months on Enyeama’s return to the Eagles but the keeper has yet to make any statement on it. Rather he has focused on his club form, which I believe is more important. Meanwhile, Eagles assistant coach, Alloy Agu, said Enyeama would not walk into the team’s starting line-up whenever he decides to return. “We’re comfortable with our goalkeepers. So, should Enyeama return, he will have to fight for his place in the team. There will be no automatic shirts for any player,” Agu was quoted as saying by Score Nigeria.